I recently traveled to California for the assignment of filming the new construction of the San Francisco-Oakland Bay Bridge. The new east span is the largest suspension bridge in the world as was built on the premise of public safety in the event of an earth shattering earthquake occurring again. The current (Original) bridge buckled and a section collapsed after the last major earthquake struck years ago. 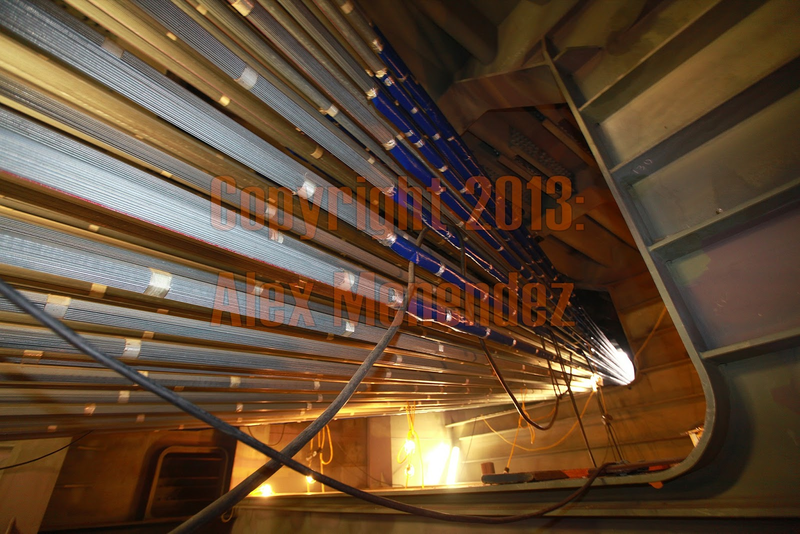 This new structure is built of hollowed out steel sections that are joined together, almost like a large train, but with the girth of an aircraft carrier….a total of 5 lanes wide with a bike path and hi-tech LED lighting fixtures. This particular assignment was for me to capture the build and archive the way the structure is connected, both above and below the bridge. Entering through the roadway was almost like climbing down into a manhole in a major city street. The backpack and the two cameras I carried over my shoulder made the entry very difficult, with a very narrow steel ladder to climb down. Once in the structure, I quickly noticed that each section was lit by the orange halogen bulbs, and the air was thick with various gasses and welders smoke. The hollowness of the steel made the construction work above sound like I was in a motorized subway, hum after hum followed by the never ending buzz of electric lines over my head. To describe it would be like the sound of a stirred up bees nest in your attic. The steel walkway that went down the center of the aisle was still cluttered with nuts, bolts and boxes of steel connectors. After assessing the scene, and with no tripod for long exposure shots, I decided that an onboard flash would be the only lighting I could use. I snapped shots, then moved on down the walkway, capturing images as we went. The hard helmet I was required to wear was surely needed, as hidden steel rods and corners protruded every 20 yards. The whole setup reminded me of setting strobes in the rafters at an arena, above an NBA basketball game, only much darker and confined. 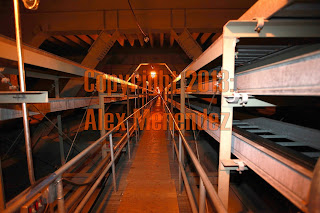 The highlight of this adventure was gaining access to the never before filmed “Splay Chamber”. This is where all the cables that support the bridge meet, and connect, to hold the bridge up over the bay. I was allowed about 5 minutes to spray this area and boy did I. These photos will one day be worth their weight in gold, and I was so lucky and thankful for the opportunity as this area has now been deemed off limits. (Due to the construction controversy of bad steel rods and the recent discovery of cracked bolts installed in various locations on the new structure). 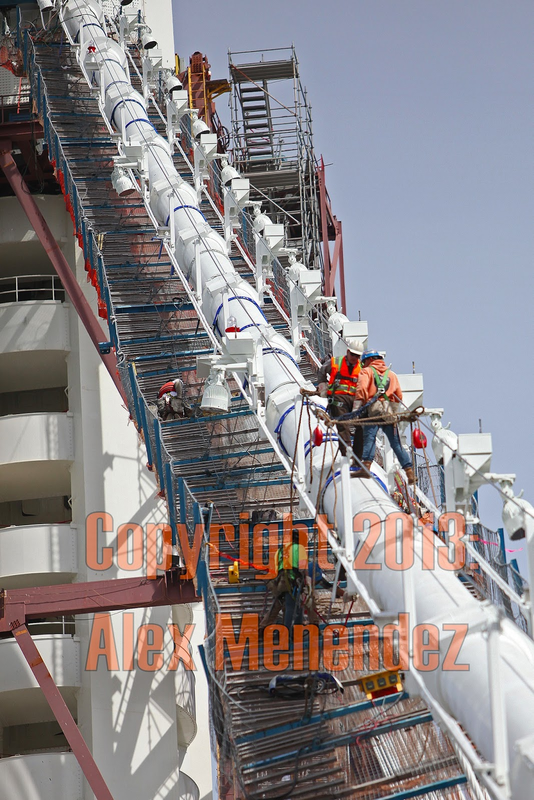 After a hot hour exploring underground…..it was time to go back up to the main deck. The workers in their orange vests were scurrying around pretty quickly and the guys on the wires, high above, were doing their jobs as if they still had their boots on the ground. 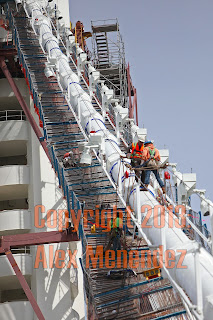 They were all tethered in, with a giant crane dropping materials, and these were some of my favorite images to capture. 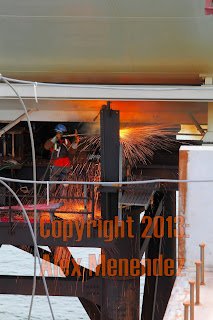 The workers blasting with the blowtorches made for some very artsy looks as well. Once done on the bridge itself, we were brought to the marina area and boarded a boat to float on and shoot under the new span of the bridge. The weather was less than ideal with a grey and white sky, which caused my photos to look as if they were shot in black and white, but the experience was so surreal, and authentic, and we all know that you cant change the weather! 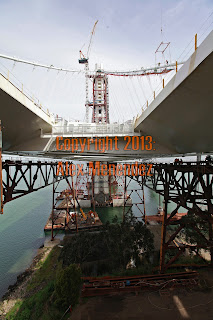 .We floated the entire length of the new span, both under and around the new structure. The Bridge Media Liason, Andrew, was a true professional and was one of the most patient and accommodating media reps I have ever dealt with, a true professional who knows how to get play for his project. My producer on the job was local, Linnea Edmeier, and many thanks to my Editor Doug Benc at Associated Press. for the Atlas V rocket launch, but couldn’t get the thought of missing this opportunity to film at Cape Canaveral out of my mind. 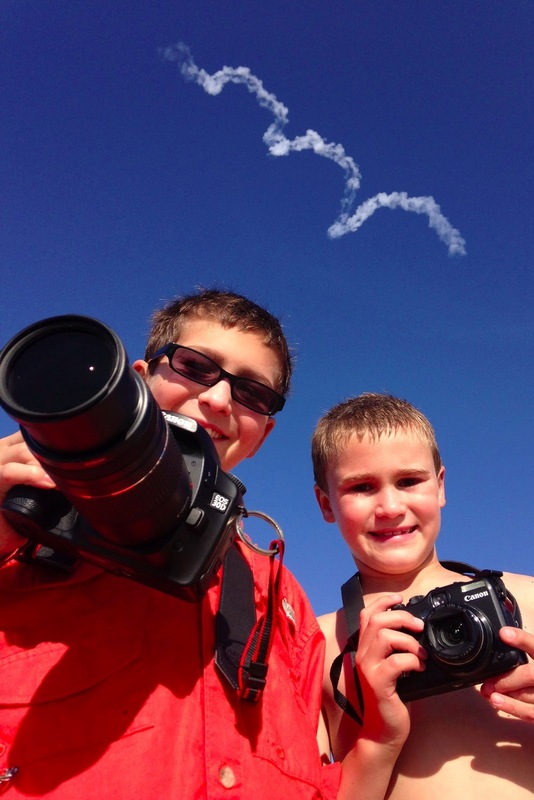 When a rocket blasts off and you are within sight and close enough to taste the smoke, there is no better feeling. To describe it would not do it justice…..AWESOMENESS exploded!!!! 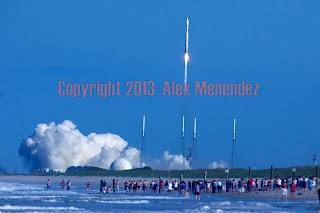 So I decided that with perfect blue skies, I would go for the 5:38 launch on Wednesday. 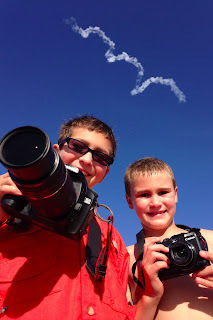 Keeping in mind that both of my sons have a science fair at school this Monday, and both of them are featuring rockets and launchers….I decided to pluck them from school, grab our swimming trunks and 4 Canon cameras…..and off we were…they were thrilled! We of course had to stop at the Twistee Treat ice cream stand on the way, (Don Montague, you know what Im talking about)…..with our bellies full we set out towards Playalinda Beach. The crowds at the park were pretty fierce and we had to drive a bit to park in a secondary parking lot. After loading up, we crossed the boardwalk over the dunes to see 4 foot waves and about 1000 spectators who had the same plans we did. After setting up a pocket wizard remote to the 70-200, the boys jumped into the Florida surf. You could barely hear their screams of joy over the hovering helicopters flying overhead, but the smiles on their faces told the whole story. Twenty minutes later, we were lined up in the waves, firing 4 cameras as the rocket lifted off towards space…. Had another opportunity to film former US President Bill Clinton today. He was the featured speaker at the University of Central Florida for their commencement day graduations. Listening to him speak, whether scripted or off the cuff, is always a treat, and today was no exception….. Some of my favorite quotes follow….